This morning was a cold and foggy morning. 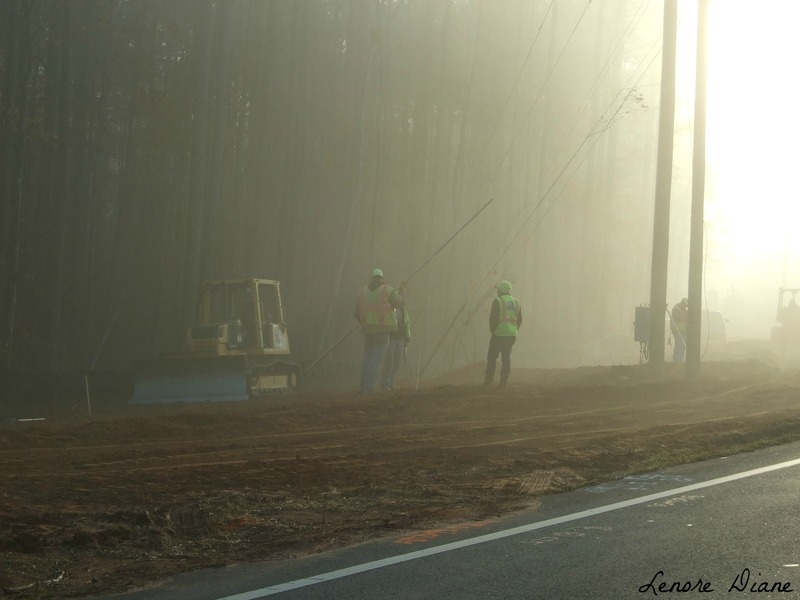 Just like caffeine slowly clears my mind’s morning fog, the sun was slowly starting to clear the morning fog surrounding the workers. Oh yes, this is a vision of my brain easing into the day. I agree, Peg. It was surreal even in person. Very cool, eerie, spooky image. It makes me thing of the tremendous work being done by crews along the east coast. Your logic/story makes sense. I have to laugh when I think how many “Top 10” lists I have on the same topic. Glad you liked the picture, Carol. Thank you. Nice shot. I’m not looking forward to foggy mornings and such. Why is it the light cycles are much shorter when trying to snap a decent photo? I do like fog. Probably because I do not see much of it. Lovely picture! Thank you, Priya. I was happy to be prepared that morning. Fog + great light + your eye = awesomeness, Ms. D! Again, another pep put in my step because of you. Glad you liked the photo. Thank you.